A normal routine with some ups and downs is coming for you. However, you will find yourself very busy with work and feel a little stressed due to it. You will have to take out proper time for your family and might not be able to buy some luxurious thing for your family. Avoid over using laptops or any electronic item. Avoid drinking and then driving. 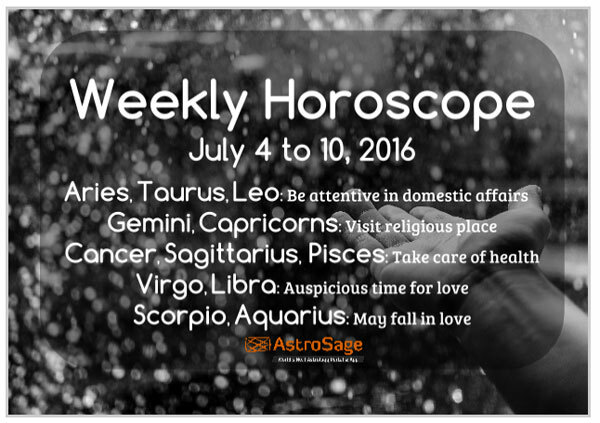 Love Predictions: This is the week which carries mixed outcomes for you Arians. An advice for you – Beware of doing such things which force your partner to suspect you or lead you to defamation. Meanwhile, some domestic issues might remain in life this week. By analyzing such situations and working accordingly can bring satisfactory results as well. The initial and mid days of the week are auspicious while the weekend is little weak. Remedy: Read Hanuman Chalisa regularly. The natives of this sign are going to feel that their expenses are increasing day by day. You might buy some expensive jewelleries. However, money is also coming your life but make sure you spend it intelligently. Businessmen will have new opportunities but working people might not have much difference in income. Avoid job change for some time. Love Predictions: Taureans, in love life this week may not go smoothly. Due to some domestic affairs and a load of work, you will not be able to balance your love life perfectly. In the case of mutual suspicion, you are required to solve matters with one another peacefully. In the starting days of the week, some disputes between you two are possible. However, in the middle of the week, good results are expected. But, weekend might bother some. Proper sleep is actually very important to lead a healthy life. Health is wealth and that is the real Mantra to live a happy life. Do not let others take advantage of your weak points, so keep it to yourself. Be careful from fake people and especially while doing business you have to be very smart. If possible, go to some spiritual place. Love Predictions: Geminis, the week is auspicious for love matters. If you are married, it will be more auspicious to visit religious place together. While, bachelors/bachelorette can visit nearby. The beginning of the week seems wonderful, your emotions will be truly valued. In the middle of the week, some tiffs in the relationship with love partner might arise. Finally, the weekend appears in which you are advised to be careful from neighbors, as they may keep an eye on you. Remedy: Don’t disclose your weaknesses to anyone. Foody self of yours will come out now and you will be a carefree foodie eating lots of sweets and fries. But make sure you have to keep yourself focused on your health. Some outing plans with friends is also possible in this week. Drive carefully during this week and be patient in work related things. Love Predictions: The week might disappoint you in terms of deep love, Cancerians. This week you'll have to avoid arguments. If there are any possibilities of awaking any debate with a love partner, go out and have fun to avoid such situation. At the beginning of the week, you'll get fewer chances to spend quality time with a lover. Mid week is beautiful, but the weekend is likely to be of mixed outcomes. Remedy: Think carefully before taking any decision. Great intellect will let you take right decisions in life and so in this week. The wisdom and might you pursue is something people also notice and find it appreciating. However, some ups and downs will also come your way but you will face them with courage. Moving ahead with your head up is your uniqueness. Avoid drink and drive system. You might visit a religious place. Love Predictions: The most wonderful week has arrived for you giving you favorable results in love affairs, which will lead to a good compatibility with a partner. Married life of Lions seems more beautiful. If a partner is demanding more from you, take a time to think before making any decision. The beginning of the week is awesome while mid week gives you fewer chances to celebrate. Over weekend little crazy fights are possible. Remedy: Regular worship will help in eliminating all the hurdles of your path. There is a possibility that you will feel stressed due to work and it might keep you distracted. So, work a little harder during this week to get desired results. Students who are preparing for competitive exams are suggested to focus more. Businessmen will have to maintain calmness in their life as some things might not go their way. Avoid unnecessary travelling. Love Predictions: Virgonians, the week promises you to be very auspicious for love compatibility. But, a workload can reduce time to celebrate and enjoy moments with love. However, whenever you'll get the chance a beautiful time will be spent with him/her. The initial days of the week are nice, chances to fall in love with a colleague are there. Even better results are there in the middle of the week. But, in the end of the week, you might have to stay at distant from a partner. Remedy: Apply patience and caution in every work. A mixture of everything is what this week is getting you. You might feel a little emotional but the performance at work will remain excellent. There are chances that you will exhausted due to some tiffs going at home. Go out to have a relaxed time as this will improve your working skills. Sleep properly and avoid taking stress. You will enjoy your weekend with friends. Love Predictions: Librans, this week seems to be auspicious in love, but you may have to rush for things. In such circumstances try to put efforts and enjoy each moment with him/her to the fullest. In the starting days of the week, many chances to go on outings will be granted. Midweek requires honoring each other. While, mid-week will be spent in a good manner. Remedy: Perform meditation for maintaining good health. Your persona will create unforgettable impression on others. The intellect you have and the way you take decisions in your life is actually very inspiring. The natives who are trying for new job will succeed in getting a desirable one. It will be good to avoid being rude at office or anywhere else. Try to delay any legal matter going on. Love Predictions: Week for Scorpions is the amalgamation of outcomes. As per horoscope, this week, you are advised not to do anything which hurt your partner's pride and reputation. Especially, in the beginning of the day constraint your personal desires as time is not less auspicious. In the mid-week, maintain harmony in love and professional life. The weekend is better, you will enjoy love, you can also get a new proposal. Remedy: Avoid being rude to anyone. Pending tasks will get completed during this week and you will get satisfactory result. People you are working with will appreciate the work you do. In this week, you might want to buy something for your home. Adding to this expenditure you might buy a gift for your beloved. Avoid taking any finance related risks. However, you might find new ways of earning. Love Predictions: Sagittarians, the week is indicating mixed results in love relationships. If you are married, you are likely to experience anger from spouse or partner's health might also suffer. The initial days of the week are quite cool, especially for married couples, better results are expected. While mid and end of the week are less auspicious. But not to worry, since weekend will prove to be better for love outcomes. Remedy: Worshiping Lord Ganesh will help in increasing good luck. You might want to experiment with home interior. There are chances that you might want to do something interesting in your business or at your office. However, this experimentation might show the result after some time however your efforts will be appreciated. Singles might get married or get some marriage proposals. Love Predictions: Capricorns will get mixed results in courtship. Some common arguments in relation are possible, thus it will be good not to create fuss of that thing intentionally. In the early days of the week take care of each other. While, take the advantage of the midweek as it contains auspicious for you. The weekend is less favorable, so stay restrained and keep visiting the shrine. Remedy: Avoid wearing black color for some time. You will behave very nicely with everyone and people will be happy having you in your life. The sense of humor you have and the way you help them in need. Even though your life will be busy with work, you will be successful in spending time with everyone. You might go a pilgrimage with your family. Siblings will support you. Love Predictions: In general, the week is favorable for love affairs to be enjoyed, Aquarians. But, as per horoscope, you are advised to maintain transparency with a love partner. Also, beware of getting into any doubts for each other. The beginning of the week is good, many cherishable moments will be received. Even there are possibilities of falling in love with a classmate or colleague. Lastly, in weekend take care of each other and be moralistic. Remedy: Take care of your health in this busy schedule. In this week, you will do something noble for poor and needy people. Doing so will give you satisfaction and will make your parents proud. Take care of your health as stomach infection might cause irritation. Drink healthy amount of water. You might be feeling inclined toward spirituality. Students will get desired results in studies and will bring happiness. Love Predictions: The week will remain satisfactory as good outcomes will be enjoyed. In the initial days, you may meet your love partner at some safe place. This week, Pisceans who are single, your heart might start to beat for someone. And, that special person might be your classmate or colleague at the office. Be careful, over the weekend as tiffs might occur especially in married life. Observe fast today i.e on April 4, 2016 on the occasion of Ashadh Amavasya and Somvati Amavasya.